Aptly named Superb Starlings, with dazzling iridescent deep blue backs, rich orange underparts and brilliant white eyes are waiting for us on the car park at Kilimanjaro airport, so that’s the ‘cover bird’ for the trip already ticked! Not far from the airport, on the road to the Ngare Sero Mountain Lodge, our driver Deo pulls over for a flock of Abdim’s Storks. This afternoon we chill out in the pool and then a leisurely exploration of the lake and stream adjacent to the grounds, inhabited by a troop of spectacular black and white Guereza Colobus Monkeys, produces Long-tailed Cormorant, African Jacana, Hammerkop, Augur Buzzard, Giant Kingfisher, Common Bulbul, a pair of African Black Ducks and then Grey, African Pied and Mountain Wagtails, all on the same stretch of stream. At dusk, dozens of Sacred and noisy Hadada Ibises pile in to roost in the trees down by the lake. A clear blue sky above Mount Meru and some lovely ‘garden birds’ first thing, including White-eared Barbet, Red-winged Starling, Wire-tailed Swallow and a pair of impressive Silvery-cheeked Hornbills, with Sykes’s Monkeys showing really well and leaping from tree to tree right outside the lodge! Down by the lake we find Striated Heron, Tambourine Dove and Black-throated Wattle-eye, followed by Malachite and Giant Kingfishers, Collared Sunbird, Grey-backed Camaroptera and the endemic Taveta Golden Weaver just downstream. Back at the lodge we spot a perched Lizard Buzzard, with Augur Buzzard, European Bee-eaters, Marabou Storks and White-backed Vulture gliding by, followed by African Black-headed Oriole over lunch. This afternoon we go canoeing on nearby Lake Duluti, and after a few domestic issues in the Hobby boat, we all get the hang of manoeuvring and it’s ‘full steam ahead’ on a clockwise circuit of the crater lake, for really close views of Great and Long-tailed Cormorants, Little Egret, Squacco Heron, Black-crowned Night Heron, knobless female Knob-billed Ducks, Palm-nut Vulture, a ‘spread-eagled’ sunbathing African Fish Eagle, Little Bee-eater, massive monitor Lizards and a stream of Malachite Kingfishers! At one point there is a clash of photo-opportunities as posing Malachite and Giant Kingfishers vie for our attention, until the sudden appearance of a stunning endemic Hartlaub’s Turaco interrupts the kingfisher contest. Further round the lake ‘boat loads’ of noisy Grosbeak and Golden-backed Weavers are nesting in the tall reeds, rounding off a fabulous day. We are up with the exotic dawn chorus for a visit to nearby Arusha National Park on the slopes of Mount Meru, looking magnificent against the deep blue sky. At the park gate we are welcomed by Common Fiscal Shrike, a perky Cape Robin Chat and smart Lesser Striped Swallows. 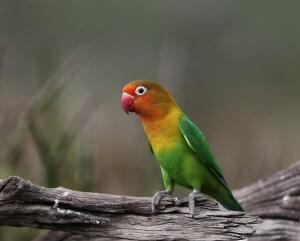 A guided walk with a Park Ranger produces Speckled Mousebird, White-fronted Bee-eater, Chinspot Batis, African Palm Swift, Black Saw-wing and dozens of Plain Martins, with Red-billed Oxpeckers riding on the backs of a nearby herd of Buffalo. On the way back from the waterfall, Baglafecht Weaver and Brown-breasted Barbet make brief appearances. Back in the jeep we spot Fawn-coloured Lark and a European Roller enjoying a winter break in tropical Africa. We reach the Small Momela Lake in time for a picnic lunch, while watching Winding Cisticola in the lakeside sedges and Rufous Sparrow and Yellow-throated Longclaw in the Acacias. After lunch, a feast of waders includes Little Stint, Ruff, Wood Sandpiper, Blacksmith Lapwing, Black-winged Stilt and eventually, after lots of directions, a Three-banded Plover, which prompts a debate on whether sun-baked mud is actually mud! A female Eurasian Marsh Harrier flushes the waders, quickly followed by a ‘ringtail’ Harrier which obligingly lands, whereupon the distinctive circle around the face shows it to be an immature male Pallid Harrier. Arriving at the Big Momela Lake, we are greeted by a mesmerising sight, with thousands of Lesser Flamingos decorating the margins and dotting the lake surface, almost like rafts of pink swans. Amongst the babbling throng are a few larger paler Greater Flamingos as well as African Open-billed Stork, Egyptian Geese and handsome Cape Teal. Back in the bush, we find Helmeted Guineafowl, Namaqua Dove, White-browed Coucal, Grey-headed Kingfisher and Brown Snake Eagle, followed by Bushbuck, Waterbuck, Giraffe, tiny Red Duikers, Olive Baboons and Blue Monkeys! The summit of Kilimanjaro is clearly visible this morning as we leave our lovely lodge en route for Tarangire National Park. Along the way we pull over for hundreds of Abdim’s Storks swarming across the plain, and also find Fischer’s Sparrow Lark plus Capped and Northern Wheatears. Welcome to “Tarangire National Park” announces the sign at the entrance gate where super-rich pickings include very tame White-headed Buffalo Weavers and Northern White-crowned Shrikes, as well as Diederik Cuckoo, Abyssinian Scimitarbill, Spotted Morning Thrush, the endemic Ashy Starling and a lovely little Green-winged Pytilia. Just inside the park we find Red-chested Cuckoo, Magpie Shrike, Red-billed Buffalo Weaver, Lilac-breasted Roller and a large herd of Impala. We pull over for a Fork-tailed Drongo and in the next half hour this one spot also yields Mourning and Laughing Doves, African Hoopoe, Red-billed Hornbill, Red-faced Crombec, Blue-capped Cordon Bleu, Brubru, Speckle-fronted Weaver, the endemic Fischer’s Lovebird and a pair of Cardinal Woodpeckers! Pygmy Falcon is our next sighting and then Margaret spots “Emus”, although we all realise that as Emus (from Australia) can’t even swim let alone fly, she means Common Ostriches. A small swampy area reveals a Black-headed Heron and a pair of elegant Grey-crowned Cranes, and back in the Acacias just before lunchtime we spot a Silverbird. At the picnic site we are joined by Ashy and Superb Starlings as well as Woodland Kingfisher, White-browed Sparrow Weaver, Grey-headed Sparrow and a group of Fischer’s Lovebirds which pose beautifully for the cameras. Back ‘on track’, we find Red-necked Spurfowl, watch a mud-bathing Warthog and bump into our first Elephants near the river, where immature Bateleur and Tawny Eagles are having a drink together. Also near the river are Pied Kingfisher, Speckled Pigeon and Red-billed Queleas in prime breeding plumage. It’s now late afternoon and we are still finding new birds such as Crested Francolin, Yellow-necked Spurfowl, African Grey Hornbill, Crowned Lapwing, endemic Rufous-tailed Weavers, the bizarre White-bellied Go-away-bird and a pair of Black-faced Sandgrouse dust bathing in the middle of the track! The sign to Tarangire Safari Lodge says “Awesome View” and that is certainly true as the open plan lodge is on a cliff with a panoramic view of the Tarangire River down below, flowing through a rolling green ‘parkland’ landscape. This morning’s dawn chorus is joined by a roaring Lion and before breakfast we get close views of an Orange-bellied Parrot feeding on fruits in a bush right by the terrace. Straight after breakfast Arrow-marked Babblers are on the terrace and we find a tiny African Scops Owl roosting outside tent number 10. We begin the day’s game drive with three Long-tailed Shrikes displaying in a bush, a Zitting Cisticola in mid air display and a Southern Ground Hornbill in a tree! Further sightings include a small flock of Wattled Starlings, Double-banded Courser posing right by the track, three Grant’s Gazelles and a herd of very attractive Besia Oryx visiting a small waterhole. Also by this waterhole are Ring-necked Doves, Brown Parrots, Spotted Flycatcher, a very vocal Rattling Cisticola and a Dwarf Mongoose on a red termite mound, with three Bateleurs soaring above. Next we find a pair of Nubian Woodpeckers, a pair of Striped Kingfishers, enjoy a close encounter with a herd of Elephants with babies, and watch a Red-and-yellow Barbet probing into a hole in the top of a termite mound. At noon a stake out of the river yields Reedbuck, Grey-headed Kingfisher, Black-headed Weaver and a pair of Grey-crowned Cranes which gradually work their way along the river and right past us until they meet a Saddle-billed Stork, with the ‘mother of all beaks’, working the river in the opposite direction! Meanwhile a five foot Monitor Lizard is on the prowl along with Common, Green, Wood and Marsh Sandpipers and a Greenshank. Moving on our path is blocked by a herd of Elephants enjoying the shade of one of the park’s huge Baobab trees, and a 360 degree scan of the landscape produces a count of at least 100 Elephants! While waiting for the Elephants to disperse, we notice a Lilac-breasted Roller scolding a Von der Decken’s Hornbill for daring to share the roller’s branch. Beyond the Elephants we bump into a group of ten Giraffes (some carrying Yellow-billed Oxpeckers) gathered for a drink at a ford. With Montagu’s Harrier, Great Spotted Cuckoo and European Rollers and Bee-eaters, the green ‘parkland’ landscape is reminiscent of Extremadura in spring, but with Acacias instead of Cork Oaks. Back by the river we find a Collared Pratincole and two Water Thick-knees before returning to the lodge for an ‘early bath’ in the pool and a fabulous lightning show after dark. The overnight rain continues as we leave Tarangire, with a tree full of Lesser Kestrels apparently sitting and waiting for the rain to pass. At the park gate male Black Bishop, with a ‘day glow’ tangerine hood, and Vitelline Masked Weaver both show well. We pass thousands of Cattle Egrets gleaning rich pickings without cattle, on the road to Lake Manyara National Park, where new birds include Yellow-billed Stork and Crowned Hornbill, while singing Nightingales remain invisible in the dense bushes, unlike the numerous European Rollers and Bee-eaters. 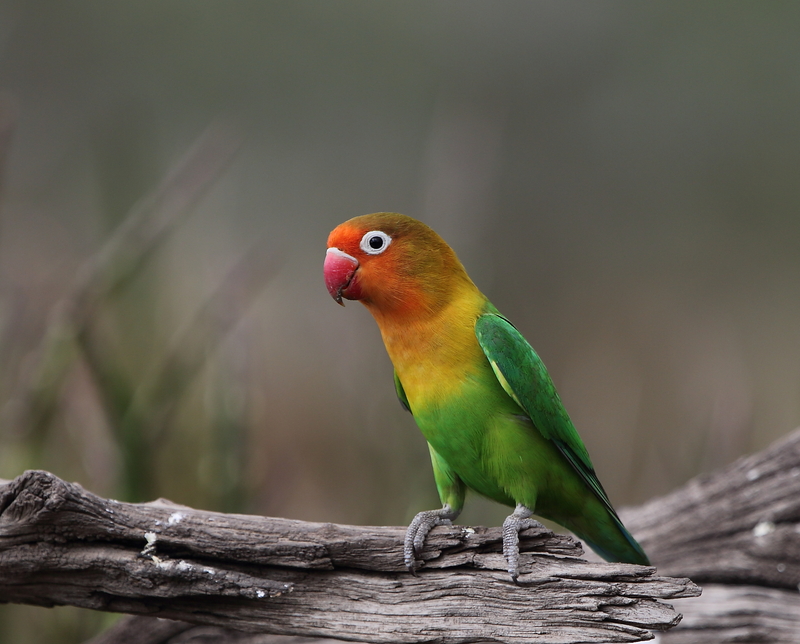 Further new birds include Broad-billed Roller, Emerald-spotted Wood Dove and a magnificent Purple-crested Turaco. Leaving the forest for open grass on the edge of the Manyara marsh, we find hundreds of foraging Baboons, hundreds of Collared Pratincoles, four Southern Ground Hornbills and several Yellow Wagtails following a group of Blue Wildebeest. The viewpoint at the Hippo Pool is a great place for a picnic while watching plenty of wildlife, including a massive Hippo grazing barely thirty yards away! The rich variety of birds includes Cattle and Intermediate Egrets, Black-headed and Squacco Herons, Eurasian Marsh Harrier, Water Thick-knee, African Jacana, Sacred and Glossy Ibises, Grey-crowned Crane, Long-toed and Blacksmith Lapwings, Wood and Common Sandpipers, Little Stint, Ruff with white heads, Isabelline Shrike, loads of Egyptian Geese and very vocal Winding Cisticolas. Not far from Country Lodge is Gibbs Farm on the outer slope of Ngorongoro crater, where a track through the forest leads to ‘Elephant Caves’ hacked out by Elephants as they dig for minerals to supplement their diet. Thick-billed Seedeater is the first sighting on the track and then a White-eyed Slaty Flycatcher feeding a youngster marks the start of a flurry of activity from one spot as a succession of birds appear including Grey Cuckooshrike, Black-backed Puffback, Bar-throated Apalis, Tropical Boubou, White-tailed Blue Flycatcher, with a fabulous fantail, and a lively pair of African Paradise Flycatchers, with a long flowing tail on the male bird. Further along the trail we scope a Long-crested Eagle, followed by close views of Cinnamon-chested Bee-eater, Brown-headed Apalis and Purple-throated Cuckooshrike, shining purple all over! We also find the amazing Schalow’s Turaco with an incredibly high vertical crest. After a first class lunch back at the farm, the afternoon is a complete washout due to a torrential downpour, with hail stones, forcing us to relax back at the lodge! It’s a big day today with a visit to the fantastic Ngorongoro Crater, the world’s largest caldera, and jam-packed with wildlife. Just inside the rim are the Red-collared Widow, plus Golden-winged and Scarlet-tufted Malachite Sunbirds, and lower down the inner slope below the forest is the African Citril, followed by the endemic Jackson’s Widowbird, Variable Sunbird, Stonechat, Whinchat, Long-billed Pipit and lots of Buffalo ridden by Red-billed and Yellow-billed Oxpeckers. We are now on the crater floor, a wide expanse of open grassland, where we find a Kori Bustard strutting past the jeep at barely ten paces! Also here is the Northern Anteater Chat and some Hartebeest, but pride of place must go to the Lions. Way off in the grass is a barely visible Lioness, lying with its paws in the air, with the tail of another showing nearby. Gradually more and more heads and tails pop up and once the pride begins to move we count at least twelve Lions including several cubs, and yet minutes earlier there was virtually nothing to see! While the Lions head towards the shade of a line of trees along a watercourse, we do a U turn, hoping to meet them on their way. Once we get there a line of jeeps is already parked along the track which ‘our’ Lions intend to cross on their way to the trees, and as we watch, a line of twenty Lions is now moving purposefully towards us! They cross the track ahead of the jeep and disappear into the bottom of the watercourse, except for three wayward ‘teenage lads’ with pre-pubescent manes, who decide to make do with the shade from one of the parked jeeps! With a Lion in front of the nearside front tyre, and two more behind it sprawled half way underneath, the vehicle seems trapped, and so when the engine starts and the reversing lights come on I instinctively scream “no!” while Deo shouts something more meaningful in Kiswahili to the driver and a potential disaster is averted. Eventually the lions are persuaded to move on. During the action, three Pallid Harriers are hunting close by, and two Lappet-faced Vultures glide in to their tree top nest along the watercourse where the Lions are now holed up, while two Black-shouldered Kites are also in the same tree as the vultures. Further exploration of the crater floor produces Pectoral-patch Cisticola, our first Spotted Hyena of the trip and then a congregation of Senegal Lapwings. At the start of the day we set Deo the task of finding us a Black Rhino! Remarkably, shortly after midday we find one of the very few surviving individuals of this awesome species, complete with two dagger-shaped horns. How lucky we are to have lunch while watching such a rare wild creature, feeding just a couple of hundred yards from the jeep, and at one stage a male Montagu’s Harrier settles on the ground in front of the Rhino! By now the gathering storm clouds are releasing their rain and the jeep roof has to come down for a while until the rain eases off. This afternoon several Golden Jackals are added to our growing mammal list and a Kori Bustard puts on an impressive display by erecting his neck plumes while cocking his tail forward to touch the back of his neck. Elsewhere on the crater floor we watch numerous Sacred Ibises and Red-capped Larks, and beside a large pool inhabited by several Hippos, a few dropped crumbs create a feeding frenzy amongst the Speke’s and Rufous-tailed Weavers, Superb Starlings and Fan-tailed Widowbirds. Also here are Black-crowned Night Heron, Purple Heron, yellow-billed Black Kite, African Fish Eagle and a low flying Banded Martin. Moving on to the large shallow lake, we find Great White Pelicans, Gull-billed Terns and Kitlitz’s Plovers with chicks. It’s now late afternoon and time to vacate the crater. On the way out new birds include Dusky Turtle Dove, Hildebrandt’s Francolin, African Marsh Harrier, an awesome Martial Eagle perched in the scope, and a Lanner Falcon on a trackside rock, forcing an emergency stop just a few yards short of this fabulous raptor while it simply sits there giving a fantastic view! Today we leave Country Lodge and head west through the Ngorongoro Conservation Area dotted with Maasai villages and their cattle and goats, where new birds include Red-rumped Swallow, African Harrier Hawk, Eastern Chanting Goshawk, Taita Fiscal Shrike and Black-faced Waxbill. We are now in a vast treeless plain surrounded by Chestnut-bellied and larger Yellow-throated Sandgrouse, when suddenly we notice Vultures descending from the big sky. By the time we reach the spot, the fresh carcass of a Thomson’s Gazelle is being torn open by a mob of White-backed and Rüppell’s Griffon Vultures, many with blood-stained heads, until a pair of Golden Jackals race in to break up the melee and pull at the disembowelled body while the scattered vultures quickly close in again to overwhelm the jackals. The carcass is now buried by a rugby scrum of vultures, kicking up a cloud of dust and feathers as they squabble noisily, with more and more arriving all the time, including lightweight Hooded Vultures and heavyweight Lappet-faced Vultures, which strut towards the crowd with outstretched wings to bully the others out of the way, while three Marabou Storks watch from the periphery. Within minutes the chaos dies down and the sixty or so vultures disperse, leaving a completely stripped skeleton! Moving on, we devour our own lunches, surrounded by more sandgrouse, and then find a group of Caspian Plovers and a Grassland Pipit, followed by a single White-headed Vulture, Tawny-flanked Prinia, Black-lored Babbler, the endemic Hildebrandt’s Starling and a flock of Gull-billed Terns beside Lake Ndutu. Journey’s end is the Ndutu Safari Lodge on the edge of the famous Serengeti National Park, where sleek well mannered Common Genets, with attractive spotted grey coats, emerge from the thatched roof of the dining hall each evening to entertain guests during dinner! A Willow Warbler is singing outside the lodge at breakfast time, while the bird bath is alive with a crowd of exotic bathers including Fischer’s Lovebirds, Black-lored Babblers, Superb Starlings, Rufous-tailed and Black-headed Weavers, Red-billed Buffalo Weavers, Blue-capped Cordon Bleus, Grey-headed Silverbills, Swahili Sparrows and White-bellied Canaries. 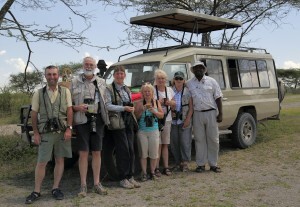 We set off on a morning game drive which runs well into the afternoon as there is so much to see. Early birds include Rock Thrush, Steppe and Long-crested Eagles, Spotted Thick-knee, Pied Wheatear, Pygmy Falcon and the long-legged ‘tarty’ looking Sectretary Bird. It’s still quite early when we find a family of ten Bat-eared Foxes, resting up while tenderly grooming each other, with Chestnut-bellied and Yellow-throated Sandgrouse all around the jeep. A nearby swamp adds Temminck’s Stint to the list and out on the vast plain there are Wildebeests in their thousands, although there is one less today, brought down by a still panting Lioness. Amongst all the Wildebeest and Zebra, we find a pair of tiny Steenbok, resting in cover, and then stumble upon a medium sized cat with a beautiful spotted coat called a Serval, stalking prey in the low vegetation. Within ten minutes of the Serval photo-shoot we have two adult Cheetahs in our viewfinders, shooting frame after frame as they survey the passing lines of Wildebeest. After a late lunch back at the lodge, we are out in the jeep again, spotting Pearl-spotted Owlet with the tail of a hapless rodent still protruding from its beak, and ten minutes later the much larger Verreaux’s Eagle Owl, with pink eye lids, snoozing in the shade of an Acacia. Barely ten minutes after this find, we arrive at a crowd of jeeps encircling a tree with a Leopard on one of the large branches! Unphased by its audience, the young Leopard decides to come down from the tree and casually walk along the track, like a super model on a cat walk, as dozens of cameras click away at the beautiful creature. After a forty five minute show, the Leopard lies down for a snooze just six yards from our jeep! That’s four different cats in one day, and we still have time for good views of the endemic Grey-breasted Spurfowl! With so much to see yesterday, we decide on a packed lunch for today’s game drive, to pack in as much action as possible. Close views of a Tawny Eagle raiding a prickly starling nest is followed by three impressive but wary Eland. These largest of the African antelope are even bigger than the Wildebeest, which are swarming across the vast plain from horizon to horizon, creating a remarkably incredible spectacle. Meanwhile shiny violet dung beetles are working hard to bury the evidence of the Wildebeest throng. At noon we find a shy African Wild Cat hiding in cover, and then Great Kestrel, with white eyes, makes three different kestrels on this trip. After a picnic overlooking a marsh jam-packed with Wildebeest and Zebra in mind-blowing numbers, we find a pride of six unsurprisingly well fed Lions, with two impressive ‘kings’, sleeping in the shade of an Acacia tree just ten yards away! Within the hour we are watching a mother Cheetah, flicking flies with her tail, while resting in the shade with her two cubs, and a Dark Chanting Goshawk concludes another fabulous day ‘on safari’. There is a moth by the lodge reception this morning with wings as wide as a handspan! Back ‘on safari’ we find a family of Cheetahs with three cubs, which eventually come to rest, just twenty yards from the jeep. Moving on we find two more Bat-eared Foxes and at a Ranger post, we find a Rock Martin building a mud nest attached to a light bulb under a porch! A circuit of Lake Masek provides close views of numerous Cape Teal as well as Hippos with tiny calves, and on the way back to the lodge for lunch a band of a dozen or more Banded Mongooses crosses the track ahead of the jeep, and we find Great Spotted and Back-and-white Cuckoos in the same tree. After lunch we spend more quality time with the family of four Cheetahs and enjoy close views of a pair of Coqui Francolins. Today we visit the world famous Serengeti National Park, driving for miles across the ‘endless plain’ grazed by tens of thousands of Wildebeest, Zebra and Grant’s and Thomson’s Gazelles on such a grand scale that a camera can’t do justice to the amazing scene. There are plenty of White and Abdim’s Storks amongst all the hooves, as well as a couple of Temminck’s Coursers and Black-winged Lapwings. Two Lions are resting with two Lionesses near the park gate, with Little Swifts above, and deeper into the park we find another Serval, plus Hartlaub’s Bustard and then a Black-bellied Bustard displaying right next to the jeep! Just after midday we arrive at a ‘pool’ of slurry with a rich aroma, packed with at least fifty Hippos, producing rich pickings for a couple of Black Crakes. We have a picnic at the Serengeti Visitor Centre, surrounded by Rock and Tree Hyraxes, with Chestnut Sparrows, Speckle-fronted Weavers, endemic Usambiro Barbets and loads of Grey-capped Social Weavers around our feet! Meanwhile there are Rüppell’s Long-tailed Starlings, Pale Flycatcher, Marico Sunbird and Slate-coloured Boubou in the surrounding trees. After lunch we find handsome antelope called Topi, spend time tracking a pride of at least eighteen Lions, making the Zebra sound nervous, and see Grey-backed Fiscal Shrikes plus Golden and Black-backed Jackals and a couple of neck fighting Giraffes on the way back to the lodge. 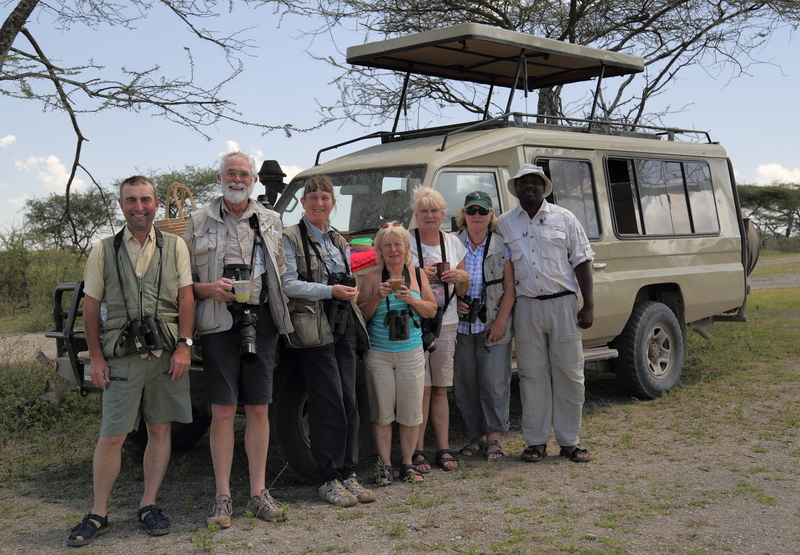 Sadly it’s time to leave Ndutu Safari Lodge, where we are still seeing new birds on the car park, namely African Cuckoo, in addition to the usual Diederik Cuckoo, Variable and Beautiful Sunbirds, Hartlaub’s and Superb Starlings, Nubian Woodpecker and Slate-coloured Boubou. Not far from the lodge, another good find is a male Pin-tailed Whydah, with tail streamers at least three times the length of his body! For the next hour and a half we drive slowly across the plain, passing thousands of Thomson’s Gazelles and a group of Caspian Plovers. Back at the crater rim, we are still finding new birds including Olive Thrush, endemic Hunter’s Cisticolas singing their duets, and White-necked Ravens with awesome beaks. With tens of thousands of Wildebeest, Zebra and Thomson’s Gazelles, a Black Rhino and five different species of cat, with a tally of forty-nine Lions, nine Cheetahs and a Leopard at six yards, plus 274 species of birds, including ten east African endemics, this has certainly been one of my most spectacular trips ever! Thank you ‘Amazing Tanzania’.